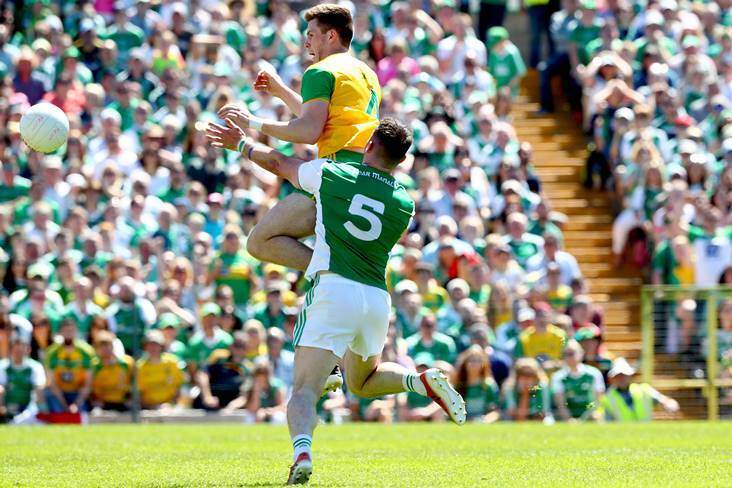 "The people with the most money get the access and that is the sad reality"
Donegal's Eoghan Ban Gallagher scores his side's opening goal in the Ulster SFC final against Fermanagh at St Tiernach's Park, Clones. Justin McNulty is lobbying BBC NI to broadcast more live GAA action. In his capacity as SDLP MLA for Newry and Armagh, the 2002 All-Ireland winner met with representatives of the broadcaster yesterday to outline his disappointment with their paltry coverage of this year’s Ulster championship. “I want to see more games on BBC and it’s disappointing that their coverage has been reduced this season,” the former Armagh footballer told The Irish News. “Two live games, two live on the iPlayer and four games deferred is not exactly a significant amount of GAA broadcasting in the North. I want them to improve their coverage, be that county football, club football, camogie or ladies’ football. “There is a huge interest in the GAA but that hunger to see our indigenous sports is not being met and it’s not being met by the BBC. I used to love ‘The Championship’ with Jimmy Smyth but the coverage of the games has been very much reduced since then. It’s wrong that people aren’t getting to see sports that they feel passionately about on TV or online. It needs to be improved and I hammered that point home.